A speeding driver who hit and killed a 78-year-old man during a police pursuit has been jailed for more than 10 years. Gavin Dawes, 33, ploughed into Jonos Sasvari while driving in excess of 80mph in a 30mph zone, a court heard. Pedestrian Mr Sasvari was killed when Dawes went through a red light at a crossing on Brighton's seafront. Sentencing at Lewes Crown Court, Judge Jeremy Gold said: "This was an appalling course of driving as is possible to imagine." He added: "You, Gavin Dawes, are solely responsible for the death of a 78-year-old man." Officers began to pursue Dawes when he failed to stop for them in the Bear Road area. After mowing down Mr Sasvari, he drove away with his front windscreen smashed, bonnet dented and number plate hanging off. Dawes, of Phoenix Rise, pleaded guilty to causing death by dangerous driving and two counts of dangerous driving at an earlier hearing. He was sentenced to nine years, but will serve an additional 15 months for a previous dangerous driving incident which he was sentenced at the same time. It will run consecutively, totalling 10 years and three months. He was also disqualified from driving for 10 years after his release from prison. Daniel Frier, defending, said Dawes felt "guilt, remorse and sadness". 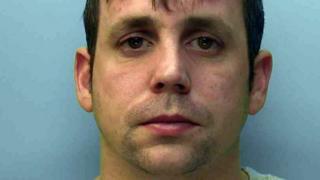 Richard Woolgar, 35, of Donald Hall Road, Brighton, was also jailed for 12 months for dangerous driving. He was seen driving erratically alongside Mr Dawes, in the minutes before the crash, but the vehicles went separate ways. There is an ongoing investigation by the Independent Police Complaints Commission (IPCC) into what happened, including "the actions and decisions of the police officers who were in the area at the time".